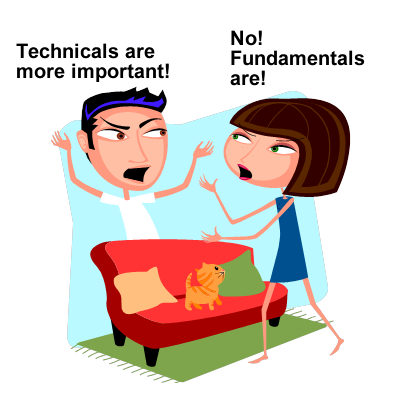 Technical or fundamental analysis, which should you use? Financial markets are flooded with analysis. But the two main analyses are based on either technical or fundamental analysis. They are two different approaches to buy and sell securities. Technical analysis looks at price movement of a security and uses that data to predict its future price movement. Many who bought stocks, bonds, or mutual funds may have lost their value after the purchase. If they are waiting to sell them when they even reach breakeven price, they can benefit from technical analysis. Some argue that technical analysis take the emotions out of stock analysis by applying universal rules. Dow Theory and price data are being heavily used by technical analysis. Many short-term investors including so called day traders use technical analysis to buy and sell securities. Fundamental analysis on the other hand looks at economic factors and predicts security price movements. Fundamentals look at profits and business trends and estimates fair value of a security. If the value is lower than the expected value, then it should be brought. Return on Equity (ROE) and Return on Assets (ROA) are being used for fundamental analysis. Many long-term investors use fundamental analysis to buy and hold securities.